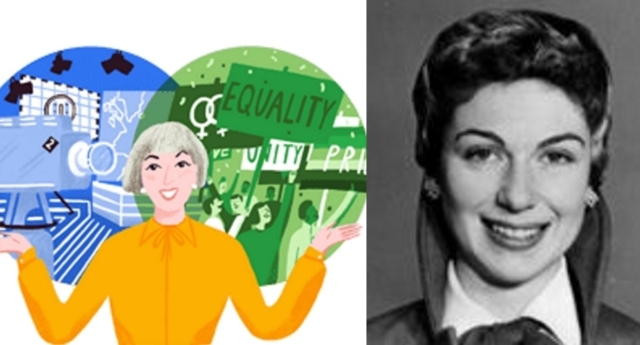 On what would have been her 91st birthday, the multinational corporation bestowed its highest honour upon LGBT rights advocate Jackie Forster. It represents a welcome move, after Google’s latest artificial intelligence offering ended up defining gay people as bad last month. After her death in 1998, writer and academic Gill Hanscombe told The Independent: “If she had served any cause other than lesbian rights, she’d have been festooned with honours”. “She would have been Dame Jackie Forster,” she added. The British pioneer also caused a storm in the world of television, on shows like Newsnight, and earned the Prix d’Italia journalism award. This is reflected in the doodle, which captures these two parts of her life in its Os. She won the Italian honour by reporting live to camera – a novel event in those days – about the 1956 wedding of Prince Rainier and Princess Grace in Monaco. And in 1969, the same year as the Stonewall Riot, she bravely stood on Speaker’s Corner and came out to the world. “You are looking at a roaring dyke,” she told the crowd. Her first lesbian encounter had taken place in 1957, on a lecture tour in Savannah, Georgia, but it had taken her 12 years, a marriage and a divorce to come to terms with her sexuality. She needed that time “to get rid of the feeling [that this] is really something rather nasty and nobody else should know about it”, she said. She took part in the first gay rights march in the UK, in 1971, and then the next year she co-founded Sappho, a lesbian magazine and social club which was a beacon of light. Sappho, in Forster’s words, was one place in an uncaring world where lesbians could “unfurl” without fear of persecution. Before her time on television, she also had a storied career on the West End stage, and even performed in several films in the 1940s. Right up until she died, Forster was part of the Lesbian Archive and Information Centre management committee, maintaining a priceless resource.